A sulfate-free, ultra-hydrating cleanser for sensitive and dehydrated skin that gently removes makeup, dirt and oil for a fresh, healthy-looking complexion. This soothing cleanser is formulated with ultra-mild cleansing compounds to lift away makeup, oil, dirt and impurities without stripping the skin of vital moisture. Developed specifically for sensitive, dry and dehydrated skin, the advanced formula is enriched with Oat Extract and Sodium PCA to help soothe and improve hydration. Skin is left feeling smooth, soft and refreshed. 100% agreed skin feels softer. 98% agreed skin feels smoother. 96% agreed skin feels nourished. 96% agreed rough skin texture looks improved. 92% agreed skin feels healthy and intensely moisturized. 92% agreed skin feels renewed. 90% agreed skin feels resurfaced. The Method: Cleanse is the second step of The Lancer Method for Sensitive and Dehydrated Skin, Dr. Harold Lancer's signature regimen of daily exfoliation, cleansing and nourishing the skin. Ideal for redness-prone complexions with very dry or delicate skin, this product should be used in synergy with Polish and Nourish for optimal results. 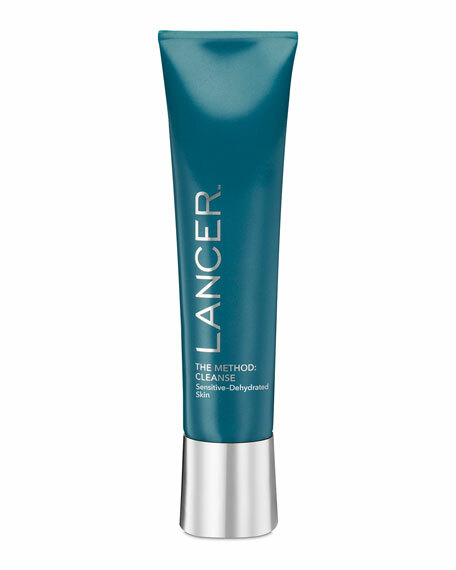 Together, the three steps of The Lancer Method dramatically improve the appearance of fine lines, texture, discoloration, and dryness, revealing a radiant, younger-looking complexion. Apply a small amount to damp skin then gently massage over face, neck, and décolleté, avoiding the eye area. Rinse thoroughly then follow with The Method: Nourish for Sensitive and Dehydrated Skin (sold separately). Water, Sodium Cocoyl Isethionate, Stearic Acid, Glyceryl Stearate SE, Cocamidopropyl Betaine, Cetyl Alcohol, Glycerin, Avena Sativa (Oat) Kernel Extract, Lavandula Hybrida Oil, Dipotassium Glycyrrhizate, Sodium PCA, Panthenol, Potassium Sorbate, Xanthan Gum, Caprylyl Glycol, Phenoxyethanol, Chlorphenesin, Methylisothiazolinone, Methylchloroisothiazolinone, Linalool.